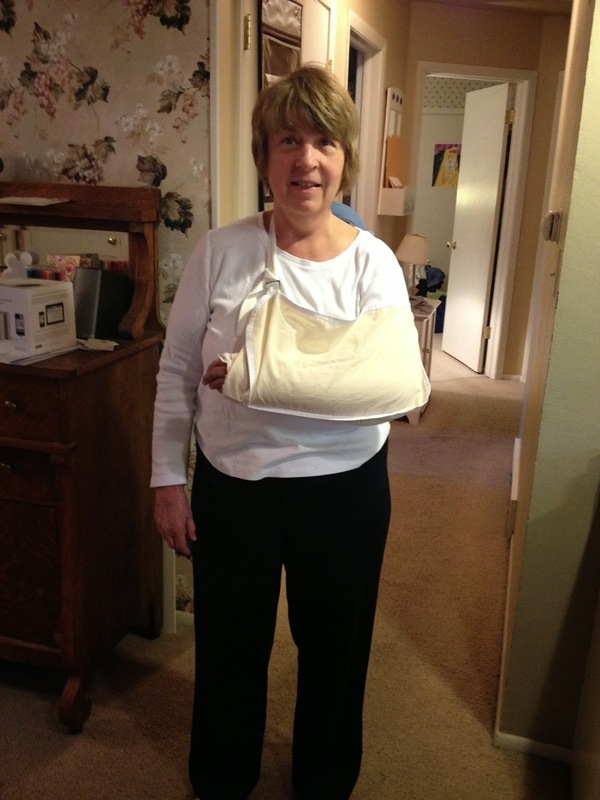 You may have seen on Facebook that I fell and broke my wrist in two spots. I'd like to say that I was horseback riding or perhaps even skydiving and did it that way. However, I just fell over my own two feet. When I was yet on the ground, I looked around for a crack in the sidewalk, a stone, or a crevice but there was nothing on which I could blame my fall. My husband was with me and I couldn't find any reason to blame him either. I just fell over my own two feet. The pain was so great that I knew right away I had broken something or another. We were about two blocks from home in front of a home. The couple that lived there were just driving in the driveway and saw the fall. She was a nurse and so ran into the house and got an icepack to wrap around my wrist with the news that she thought I better get up to the emergency room. Dwayne took me there and sure enough –– two bones were broken. This was a Sunday so the next day I saw an orthopedic doctor who told me I'd need surgery. On Friday I had the surgery so now I have a plate and screws in my wrist. Don was all set to tangle the cast except I will not have a cast. It will be, after the stitches come out, a removable brace. That sounds good to me. I am Director of Music at Delafield Presbyterian Church, playing keyboard each Sunday so, of course, that was a concern. Because we have an electric keyboard on which I can record things. I was able to record the left hand part with my right hand and then play along with the recording also with my right hand. All is well!!! I spent a couple of days with nausea and pain and I think my hubby didn't know what to do with me. He stopped and bought a stuffed animal and also an infinity scarf. Both I am enjoying. 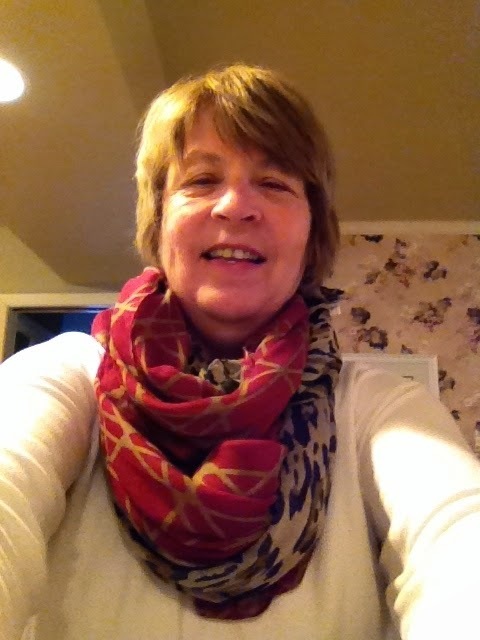 I have to show you picture of how I am using the infinity scarf. 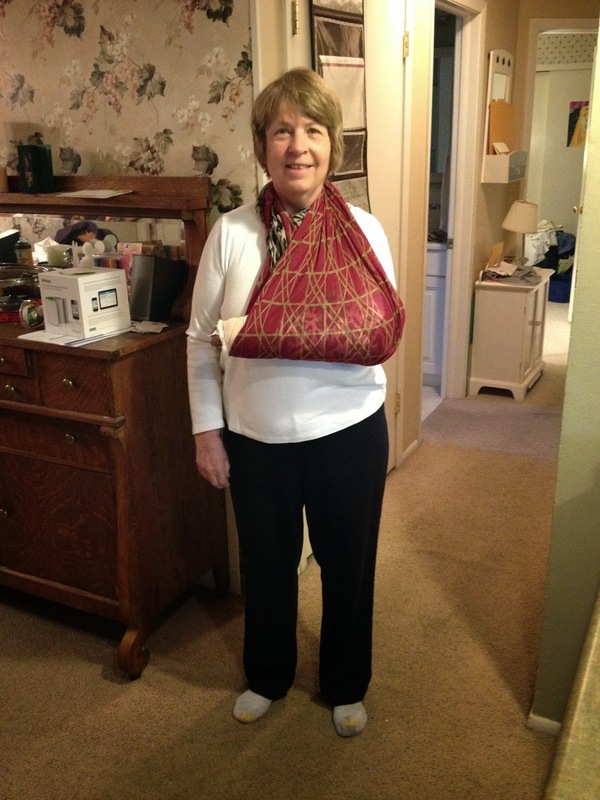 I think the scarf works better as a sling than the regular sling, don't you? 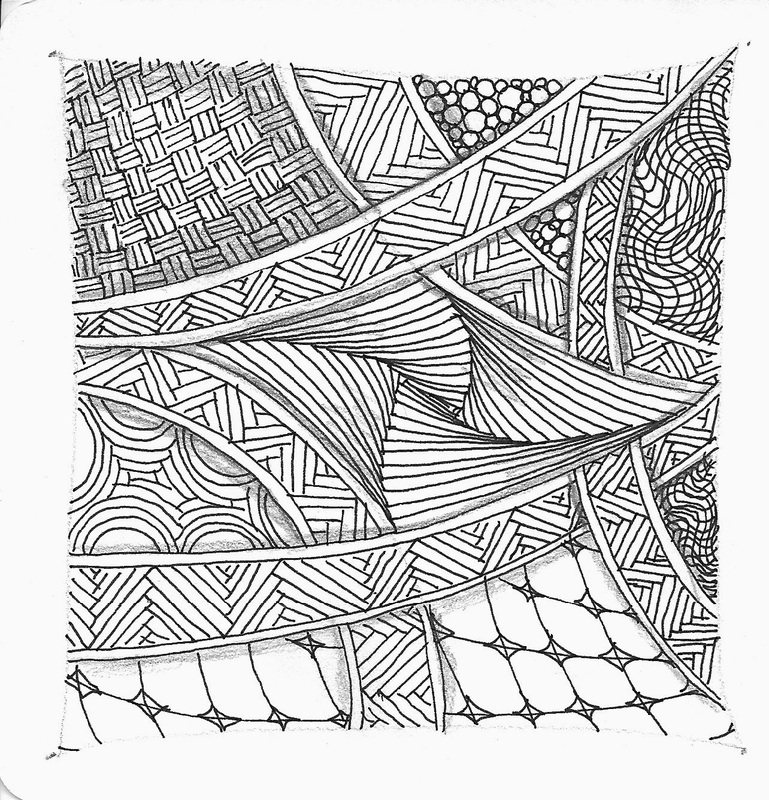 Here is the tile I tangled in the hospital while waiting for the surgery to begin. By the look of that tile I'm guessing you broke your non-dominant wrist. Silver lining and all that! I do hope you heal well and are back on the piano for two hands pdq!